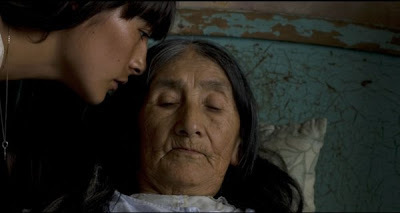 The cinema of South America made a considerable noise at the closing ceremonies of the 59th Berlin International Film Festival, winning most of the top prizes. In a year that saw weak entries from Europe and the United States, the glory migrated south of the border. A debut feature by Uruguyan director Adrian Biniez was the night’s big winner, copping three prizes, including the Berlinale Silver Bear (shared with German director Maren Ade’s ALLE ANDEREN), the Alfred Bauer Prize (shared with Polish icon Andrejz Wajda’s TATARAK) and a special nod for Best First Feature. GIGANTE focuses on the loneliness of a 35 year old supermarket security guard who begins a mysterious relationship with a late night cleaning woman. Both are working the “graveyard shift”, which only fuels their obsessions and the mystery surrounding their involvement. Eventually, the guard begins to revolve his entire life around the cleaner’s daily routine, which eventually leads to a telling confrontation. The film was co-produced with Argentina, Germany and The Netherlands and was being sold in Berlin by The Match Factory (make that 2 and 0 for the Cologne-based sales agency). The Silver Bear for Best Director was won by Iranian writer/director Asghar Farhadi for his cross-cultural drama ABOUT ELLY (Uber Elly). The film focuses on an Iranian man who returns to his native land after a failed marriage upends his life in his adopted country of Germany. Upon his return, he becomes involved with a young nursery school teacher, who mysteriously disappears. Acting honors were split between German actress Birgit Minichmayr for her dramatic turn as a disillusioned spouse in the drama ALLE ANDEREN (Everyone Else) by Maren Ade, and veteran Algerian actor Sotigui Kouyate for his role as a father who comes to London to discover more about the death of his son in the 2005 London terrorist attacks and his encounter with the mother of another victim, played by Brenda Blethyn.